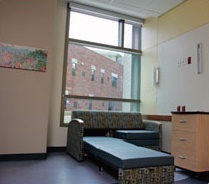 Our patient care rooms were designed with many unique features to promote family centered care. Single inpatient rooms are “zoned” with distinct areas for clinical care, patient area and a family area. They are furnished with a daybed, storage, comfortable seating and a desk with Internet access. Free Wireless internet service is provided for our net savvy patients and families. Future plans call for set-top boxes to provide movie rental, games and educational software. A future web portal will let families look up health information, pay bills, schedule appointments and build websites to communicate with friends and families. Each floor of Dell Children’s has a patient zone, a work zone and a family zone. Each unit has a waiting room to give families a place to spend time while patients are asleep or receiving treatments. 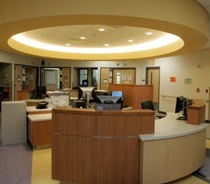 Circular eight-room pods have a nursing station just outside the doors of every patient room. In addition, a Family Resource Center serves as an “on-site library of information” for patients’ families. Staff is available for personal consultation and online and print materials will offer up-to-the minute information on a wide range of medical conditions and treatments. Take a moment to learn a bit more about the Dell Children’s Medical Center facility. Get the latest news about pediatric care, the most advanced research and the many ways Seton continues to improve healthcare for kids throughout Central Texas.